I wasn't around in 1965 so I cannot speak to this card from personal experience but I understand it was part of a set offered as an insert to the regular-issue Topps set. So basically, when you opened up your pack of cards, one of these embossed beauties was randomly inserted. Did you also get the stick of gum? I guess. I'm really not sure. By the time I was seriously collecting cards, all I ever got was that stale piece of gum. But that didn't stop me from chomping on it. I know Topps experimented with several different inserts including posters and I think coins. This is where I need your help. Do you have a favorite Topps insert? Was was it and from what year? And someone please answer the question: Was the piece of gum included? It's been about a month now that I walked into my local baseball card shop and bought about a dozen 1948 Leaf baseball cards. Each card seemed to be in worse condition than the next but that was alright with me. The highlight of the lot was a Lou Boudreau that I paid about $15 for. At least that's what I thought was the highlight. While looking through the group of cards about a week ago I found this Joe Gordon. It was $5. Not bad for a card of a man that was elected into Baseball's Hall of Fame earlier today. When you pick up your newspapers in the morning you will probably read a bunch about Rickey Henderson and Jim Rice. I bet there will be no more than a few paragraphs on good ol' Joe. 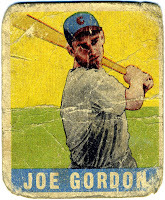 From what I know, This is the only card produced of Gordon during his playing days. There may be a few regional-type issues of Gordon but as far as widely-produced cards go, that is if you can call the 1948 Leaf widely produced, this may be the only card ever made for Gordon. A highlight of a card if you ask me. I've had televisions on my mind for the past couple of weeks. A few weeks ago, I called the repairman out to take a look at my 42-inch rear projection HDTV because it was having convergence issues (the colors were not aligning). Since the set was still under the extended warranty, I didn't care how many times the guy would have to come out, I just wanted it fixed. But before leaving for the final time he uttered those words I was longing to hear, "I'm going to have to declare this TV unrepairable." In other words, the warranty company is sending me a new one! The set finally arrived on Thursday: A Panasonic, 42-inch plasma HDTV. It's beautiful. Which brings me back to 1955. Bowman decided to include the new technology of the color TV in their design that year. This example features, in my opinion, the second-greatest player ever in Willie Mays. It includes a great photo of a young Mays in his New York Giants uniform. 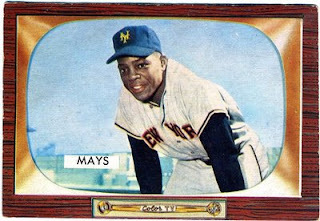 I wonder what Mays would look like today in high definition? So I was surfing the Internet a little more than a week ago and found myself gravitating to eBay. And what was I looking for? Poor old baseball cards. I quickly found these four 100-year-old cards with a best offer options. After my first offers were quickly denied, my second tries were accepted the next morning. I wonder if me buying all four cards helped. All four came out to $35. I think that's a pretty good deal considering ther age and the fact that these are not your run-of-the-mill cards. When it comes to these old cards It really doesn't matter who the player is. I know I'm not going to find a Hall-of-Famer for less than $10. So part of the thrill is finding out about the player. And boy was I lucky. Harry Lumley: In 1904, his rookie year, he led the league with 18 triples and nine home runs. George Mullin: 29 wins in 1909 led the league; pitched the first no-hitter for the Detroit Tigers (1912). Tommy Leach: The 1902 NL home run champ, he had six - all inside the park. Red Dooin: Was a player-manager for the Phillies from 1910-1914. "Nervous fidgeting with baseball cap earned him his nickname. 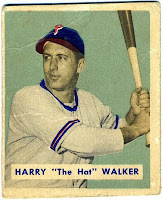 Began in majors with Cards, then was traded to Phils in 1947. At end of 1948 went to Chicago Cubs. Led NL in hitting while playing with more than one club during same season. In three World Series and on two All-Star teams." No need to know on base percentage, slugging percentage, stolen bases or doubles. All you need to know is that Walker had one of the best nicknames in the game and that he was a pretty doggone good ballplayer. I know the 1933 Goudey set is a classic among baseball card purists, but in my opinion the 1934 edition may be even nicer. Not only do you get the quality and bright colors of the 1933 set, you also get a nice little portrait of Lou Gehrig or in a few cases Chuck Klein. 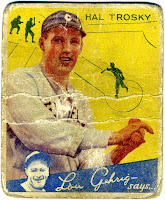 The card's back also includes the thoughts of Gehrig, or Klein, about the player depicted. As for Hal Trosky, he was a pretty good player. He had a few monster seasons including 1934 when he hit .330 with 35 homers with 142 RBI. In 1936 he had his best season while batting .343 with 42 homers and 162 RBI. Trosky finished his career with 228 homers and 1,012 RBI. Not bad. I get a few baseball card catalogs in the mail every so often and one thing I have noticed lately is the price of Reggie Jackson Cards. With the exception of his 1969 rookie, most all Jackson cards are quite affordable. While I did not get this second-year card through a catalog, I did pick it up for under $5. I consider Reggie Jackson to be on of the game's true stars. But the price of his cards seem to reflect that of a middle-tier Hall-of-Famer rather than the icon I believe he is. I'm not sure why. After all, he was a Yankee. But that's okay with me if it means I can grab a few of this man's cards for less than the price of lunch. One of the coolest things about having an iPhone is being able to easily check my various e-mail accounts. So about two weeks ago, between all those nagging messages from Nigerian businessmen, I got a note titled Yount rookie card. It was from Dave R. and it read: Saw this posting on eBay and thought it might be up your alley. So sure enough there it was, this 1975 Topps Robin Yount rookie in terrible shape. It had a starting bid of $3.99 with free shipping. I was the only bidder. So thanks to Dave R. for the heads-up on this great card. If anyone out there sees a poor old baseball card that you think fits this blog please drop me a line at pooroldbaseballcards@gmail.com. The poorer the better. You may see it on this blog in the near future. If you are a serious vintage baseball card collector you should have a few basics, including original cards of Mickey Mantle, Willie Mays, Hank Aaron, Sandy Koufax, Warren Spahn, Jackie Robinson and Ted Williams among others. And you definitely need a card of Roberto Clemente. Cards of Clemente are not cheap, but if you look hard enough, you can find one for under $20. This 1962 example cost me $25. But you don't have to be a vintage collector to appreciate Clemente. If you are a parent, consider getting your child a baseball card of Roberto Clemente instead of that video game that will be relegated to the back of the sock drawer in a few months. Get your child a card of the Pittsburgh Pirate great and tell them about his humanitarian efforts. Tell them about how he was elected into the Hall-of-Fame after an untimely death flying goods to earthquake victims in Nicaragua. Tell them how he ended his career with exactly 3,000 hits. Tell them about his 12 Gold Gloves and 12 All-Star selections. They will eventually forget about that video game, but they will always remember the time you bought them that baseball card of one of the game's greatest. If this baseball card were a movie, I would name it, "The Good, the Bad and the Ugly." The Good: Ed Mathews was beyond a good baseball player. He was actually a great one. He hit 512 homers and was a nine-time All-Star selection. He was inducted into the National Baseball Hall of Fame in 1978. A couple of interesting things about Mathews: 1) He played for the Boston, Milwaukee and Atlanta Braves, the only player to do so. 2) He was the manager of the Braves when Hank Aaron hit his 715th home run. 3) He appeared on the first cover of Sports Illustrated. The bad: The condition of this card is pretty bad. It has lots of creases and the corners are basically gone. The Ugly: That shade of green is ugly. I'm sorry but there is no better word to describe it. A closer look at this 1967 Topps Pete Rose should give you a good idea as to why it was posted. It has plenty of creases, paper loss, a little marker pen, what appears to be paint and what I can only determine is glue. Yet, it is one of the nicest examples of a card of the all-time hits leader. The back of this card is a bit foretelling. It reads, in part: "The way Pete is blasting the ball, he is sure to set many club records before hanging up his cleats."